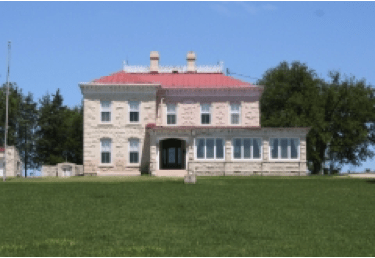 Because of the scarcity of lumber, the abundance of native limestone, and the great stone quarries operating in Chase County, there were a great many stone houses built in the early days of Chase County. The building of the Chase County Courthouse from 1872 to 1873 attracted stone masons to this county and many settled here. The stone houses of Chase County tell a unique story of the history, architecture, and the people who settled here. In 1874, James Austin hired John Shofe, a stone mason, to build a two story house on Mulberry Hill. Mr. Shofe was a stonemason on the Chase County Courthouse. This was the first home that Mr. Shofe built. The native limestone used to build the house came from the quarry across the road. It is said that some stones from this quarry were used to build portions of the State Capital building in Topeka. The west and south sides of the house are cut limestone. The north and east sides are uncut field stone. This was done purposely so that the house, when approached from the town by visitors, would look more refined. Mr. Shofe also built the stone house owned by Suzan Barnes southwest of Mulberry Hill and other stone homes in the area. The Old Mormon Trail, which lies just south of the Stonehouse, was used from 1848 to 1852- no exact dates are known. The Santa Fe Trail ran 15 to 25 miles either side. Another such trail, The Freight Mail and Immigrant Trail, ran along the north side of the Cottonwood River just opposite the Stonehouse. This trail also joined enroute with another famous trail, the Texas Cattle Trail. Many of these trails are now farm paths, country roads and even paved roads in various areas of Chase County. In 1873 the Atchison, Topeka and Santa Fe Railroad company purchased rights to portions of the Austin Farm to use as railroad right-of-way. These tracks ran east-west just north of the house. A branch of the railroad ran south to the quarry so that the stone could be hauled out by railway cars. James Austin married in 1878 and had offspring. The daughter, Sarah, married William T. Glanville in 1903. They lived in the stonehouse for many years. James Austin’s son, William Clark Austin, purchased the Chase County Leader-News, as well as a Strong City newspaper and was elected State Printer several times in his lifetime. The Austin family burial plot is located in the Prairie Grove Cemetery. The Glanville family have donated several personal family heirlooms to the Chase County Museum on Broadway in Cottonwood falls and can be seen there today. The house changed owners several times and stayed in the family until 1994, at which time it was acquired by the first owner outside the extended Austin-Glanville families. 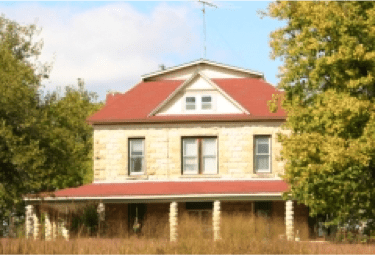 The imposing two-story stone ranch house southwest of Elmdale on highway 50 was built in 1883 by Jacob Ramer Blackshere. Blackshere was born in 1834 in West Virginia. He came to Chase County after 1866. Regarded as a pioneer and experimenter in agricultural practices, he first introduced Galloway cattle into this part of the state. He also introduced grain sorghums as a dependable grain crop. He also brought about the planting of alfalfa and marketed alfalfa seeds. The small original part of the ranch house was a one room stone structure built from field stones found on the property. The room was heated by a large open fireplace. This room is at the north end of the house. It was reportedly built in the early 1860’s, but the kitchen, dining room and upstairs bedroom were added to the south of the original room in 1865-66. More second story bedrooms and first floor sittings rooms were added in 1883. A serpentine staircase of walnut and maple connected the floors. In 1917 the roof was resurfaced with an alloy of copper, lead and tin. The metal cresting which is original to the 1883 addition was left undisturbed. The rock was obtained from stone fences on Frank Frey’s land east of Strong City. Located on the west bank of Spring Creek just west of Cottonwood Falls at the foot of the hill. Davis was a large sheep rancher. The stone was from the old grade school in Strong city. Location: one mile north of Elmdale on a hill overlooking the Cottonwood Valley. Mr. Drummond drew his own house plans. They named the farm Farvue Farm. The foundation was 4 feet wide at the base and tapered to 18” for the walls. Three stone quarries were located close by. Foundation is 4’ high. Original house was 2 stories high and included an attic and full basement. First and second floors contained 13 rooms and 3 large hallways with 9 & 10’ high ceilings. A stairway was centered in the middle of thouse.Four large stone columns were built to support the front porch of the house. There were 28’ tall and 2’ in diameter. The columns were known as the first of their kind. Mr. Shofe was the creator. A carriage house stood behind the house. The stones for the house were picked up in the Harshman pastures. The stones are veneered in cement in irregular shapes on the frame of the house. They used one truck load of rock from Canyon City, Colorado. Location: Cottonwood Falls, First Street in the southwest part of town. Location: 2 ½ m. NW of Cottonwood Falls. The rock was taken from an outcropping of stone on a hill northwest of the Prairie Grove Cemetery. Stones were taken out of a quarry near Middle Creek. The house faces south because McNee thought a road would eventually be built on the south. The road was built on the north so the back of the house faces the road. Smoke house was built in 1893. The Miller family owned the house for 4 generations. Location: 3 ½ miles east of Strong City. Two story house high on the hill. Built into the side of the hills near Bazaar. Contains 3 levels. One of the oldest stone houses built in the county. The west part of the house was built in 1871. The east room was originally a wash house. The walls of this house are as firm and true as when it was built. Built in 1881. The House was originally a barn. Shortly after the Kansas territory was opened to settlement in 1854, William and Jane Shaft moved their family from Michigan to a 160-acre farmstead northeast of present-day Clements. In 1857, Shaft and his sons erected a small stone house using locally quarried stone. Less than six months after arriving, William died while attempting to cross Diamond Creek at Harris Crossing. The family persuaded a reluctant Jane to remain in Kansas. Her sons erected a large two-story limestone addition on the south side of the house in 1868, and her name was inscribed in the dressed stone within the east-facing gable. As with other mid-19th century vernacular stone houses, the Shaft house was built in phases with the addition of a wing sited perpendicular to the pre-existing side-gabled building. Differences in the stonework clearly delineate a phased construction, and it reflects the work of the builders who responded to the locally available building materials. The roof was originally covered with wood shingles and contained a gutter system that deposited rainwater into an underground cistern at the back of the house. Today, the roof is covered with standing-seam metal and the gutter system is no long extant, but the cistern remains. The original homestead included another stone building used as a smoke house. This building was demolished in the 1960’s. Some of the stone was used to build the retaining wall for the modern day elevated driveway. There was also a family cemetery south of the house, but this plot was cleared after the 1951 flood. What could be salvaged was moved to the Clements Cemetery. The Shaft House is located northeast of Clements. The house is accessed by a gravel county road and is situated along Silver Creek in the middle of the original 160 acre homestead. Two creeks merge along the northern edge of the homestead. The road divides the farm and separates the house and barn. The Spring Hill Farm and Stock Ranch is a late 19th century enclosed cattle ranch and headquarters that outstandingly represents the transition from the open range to the enclosed holdings of the large cattle companies in the 1880s. The enclosure and consolidation of ranches during the late 19th century was accompanied by the improvement of range cattle through purebred breeding programs and, in the Flint Hills region, a distinctive practice of fattening southwestern cattle on the bluestem pastures during the summer before shipping them to market in the fall. The period of significance extends from the first purchases of ranch land by Stephen Jones in 1878 and extends through 1904, when the ranch lands began to be sold off by Bernard “Barney” Lantry’s sons. The Spring Hill Ranch house is a striking three-story structure built on a bluff overlooking Fox Creek valley three miles north of Strong City on Highway 177. A native of Tennessee, Jones had ranched cattle in Texas and Colorado before moving to chase County in 1876. He purchased several farms and ranches and became one of the largest and most important ranchers in the area. Although he was primarily a cattleman and stock-raiser, he had substantial lumber and banking interests in nearby Strong city. 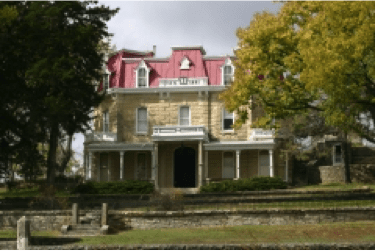 His large stone house was built in 1881 by men who had also worked on the Chase County Courthouse eight years earlier. With its mansard roof and dormer windows, the house reflected some of the same Renaissance influence as the Courthouse. The house is significant in that it represents a blending of Renaissance influence and Plains Vernacular architecture. The house and outbuildings together present a composite grouping of rural buildings, using a single building material and functioning as a unit. The Whitney Ranch is located on a hill southeast of Hymer near Elmdale in Chase County. This square limestone house was first built in 1883-85 followed by the outbuildings standing north of the house. This house was part of the original 101 Ranch that at its height in 1887 had reported holdings of 95,000 acres. Hymer was actually located in the middle of the 101 Ranch where stockyards and an elevator were conveniently located for ranching activities. The house and outbuildings are situated on top of a hill overlooking Diamond Creek. Running water was apparently a feature of the house from the time of its construction, or shortly thereafter. Water was supplied from a well on Shafer Creek, approximately one-half mile north of the house. Both a windmill and an engine were used to lift the water to a stone and concrete reservoir built into a hilltop that rose to the east of the well. Gravity then carried the water into the house. An upstairs bathroom was part of the original house, but it apparently did not contain a toilet. In 1900 the 101 Cattle Company began liquidating its holdings. Whitney, the ranch foreman, purchased the headquarters with buildings and adjacent pasture land. Between the carriage house and the reservoir, but closer to the former, is a stone foundation 30’x40’ that once was the base of a bunkhouse for the cowboys working on the 101. A huge two story barn burned after the turn of the century and a much smaller barn replaced it. Another ranch house is located at the base of the hill south of the stone ranch house. Edward Whitney moved this house, from Hymer in 1946. A limestone wall runs from the north elevation of the house to the wash house. The wall creates a private courtyard that cannot be seen from the east. A limestone walkway leads from the house to the wash room. North of the wash room is the privy. The chicken coop stands northeast of the privy while the carriage house stands northwest. For years, known as the Nelson Ranch. 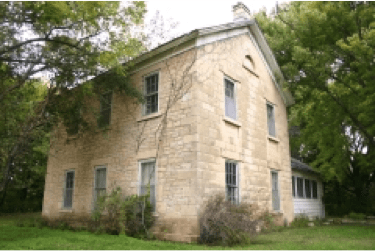 Samuel Newitt Wood, a peripatetic politician of 19th century Kansas, built a large stone house on his farm just east of Cottonwood Falls in the 1860’s. Born in Ohio in 1825, Wood came to Lawrence, Kansas, in 1854 to work for the free-state cause. He helped establish Chase County in 1858 and settled near Cottonwood Falls in 1859, where on May 30, 1859, he published the first issue of The Kansas Press, the first newspaper in the county. Dissatisfied with the slow growth of the town, he moved paper and family to nearby Council Grove in August, 1859, and lived there for three years. Sam Wood was elected in 1859 as the representative for Chase, Morris, and Madison counties in the territorial legislature. He was a member of the first state senate in 1861-62 and was in the state senate again in 1867. He also served in the state house of representatives in 1864, 1866, 1876, and 1877, acting as speaker of the house in 1877. Wood had a number of terms as Chase County attorney and campaigned for a variety of other positions over the years. 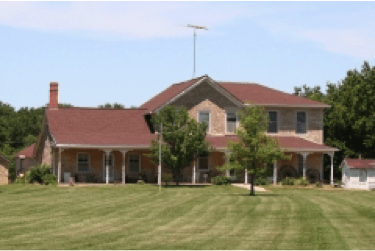 The large rambling ranch house is significant because of its connection with Sam Wood, one of Kansas’ most flamboyant 19th century politicians. Regarded by many contemporaries as one of the founders of statehood, Wood was a key spokesman and prominent participant in territorial politics from 1854 to 1861 and in the formative years of statehood. Chase County Historical Society. Chase County Historical Sketches, V. III, 1966.